June 27: A systematic assessment of the individual parliamentary performance of the Honourable Senators of Pakistan during the Thirteenth Parliamentary Year of the Senate, that is, March 12, 2015 – March 11, 2016, was carried out by PILDAT. According to the results of this assessment, the overall average performance score of the Senators is 41%. While the Senators from the Federal Capital and the three smaller provinces figure in the top five positions, none of the Senators from Punjab, the largest province, could make it to the top five positions. It is interesting to note that Senators who are all parliamentary party leaders occupy the Top 5 Ranks. 102 Senators have attained ranks or positions between 1 and 40. The Honourable Chairman of the Senate, Senator Raza Rabbani (Sindh, PPP-P) and the Honourable Deputy Chairman, Senator Molana Abdul Ghafoor Haideri (Balochistan, JUI-F), have not been included in the assessment exercise as their powers and functions differ greatly from that of a regular member of the Senate. 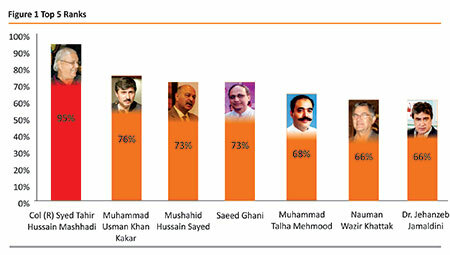 The Honourable Leader of the House, Senator Raja Muhammad Zafar-ul-Haq (Punjab, PML-N), attains a score of 62% and is on the 8th position. The Honourable Leader of the Opposition, Senator Aitzaz Ahsan (Sindh, PPP-P), is not far behind with an overall score of 57%, which is the 10th position. Federal Minister for Information, Broadcasting and National Heritage, Senator Pervaiz Rasheed (Punjab, PML-N), attains a score of 27%, which is the 36th position. Federal Minister for Human Rights, Senator Kamran Michael (Punjab, PML-N), follows suit with a score of 24%, which is the 37th position. Other notables in this assessment exercise include Amir (leader) of Jamaat-e-Islami, Senator Siraj-ul-Haq, KP, with an overall score of 63%, which is the 7th position. Newly appointed Federal Minister for Ports and Shipping and President of National Party, Mir Hasil Khan Bizenjo, Balochistan, achieves an overall score of 59%, which is the 9th position. Former Minister for Interior Senator Rehman Malik, Sindh, PPP-P, stands at the 28th position with an overall score of 36%. Current Governor of KP and former Senator Iqbal Zafar Jhagra, PML-N also at the 28th position with an overall score of 36%. 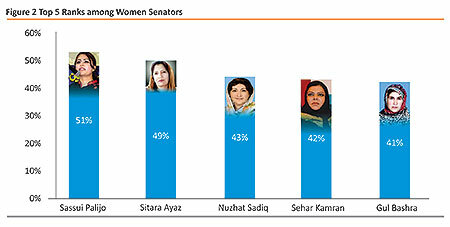 Vice-President of PPP-P, Senator Sherry Rehman, Sindh, stands at the 29th position with an overall score of 25%. The performance scorecards of senators presented in this report focus on three main aspects of the parliamentary role of a senator: Oversight, Legislation and Representation. The Top Performer in Oversight is Senator Col. (R) Tahir Hussain Mashhadi (Sindh, MQM), with an average score of 4.4 out of 5. The Top Performer in Legislation is Senator Mushahid Hussain Sayed (Federal Capital, PML), with a total of 9 private member’s bills introduced of which 8 passed in the Senate during the year. The Top Performer in Representation is Senator Hamza (Punjab, PML-N), with the highest attendance of 97% in the plenary sessions of the Senate. The methodology and framework of assessing the performance of 102 Senators were developed indigenously. The data for preparing the Score Cards was obtained from the two main public sources: The Official Website of the Senate of Pakistan1 and the ‘Report to the People of Pakistan’ produced by the Senate2. Senators themselves were also contacted to provide their updated educational and professional details. Federal Ministers have not been scored in the parameter on Number of Committees Chaired, as the rules do not allow them to be elected as Chairmen of a standing committee and most of the other committees. These Score Cards seek to provide the citizens of Pakistan with some critical information in order to empower them to monitor their elected representatives and to identify the prospective future political leadership of Pakistan. The principal objective behind this evaluation exercise is to foster transparency and greater democratic accountability in the country and to help in the mapping exercise of the future political leadership of Pakistan. This is a first attempt made by PILDAT to assess and rank the performance of Senators, and hence, may have a lot of room for improvement. We will welcome comments and suggestions for improvement in the concept, methodology and framework of assessment and presentation of the Senators’ Score Cards.